Hello my fellow comic dudes and lady dudes! So the Duke Thomas has had a weird relationship with DC. He's been teetering on limbo and obscurity since Snyder has moved away from Gotham and his reception by some fans has been all over. Some like him, some hate him for "taking up space", some are indifferent. So since we're waiting to see what Bryan Hill will do with him in Outsiders I wanted to throw his name into the P.A.D ring. So let's say DC put you (yes YOU, congratulations!) in charge of Duke's direction, where would you take him? I would particularly love to hear from those who are indifferent toward him and his detractors; how would you fix him? To his fans, where would you like him to go? To those who don't know who he is, what would you do with him? Have him lead a book? Put him on a team? Partner him up with a another hero? Have another hero mentor him? Change his look? Change his hero name? Go wild! Get creative! THIS IS NOT A THREAD FOR LAZY NEGATIVITY. If you're "pitch" is just "I'd kill him" "I'd retire him" "I'd ignore him" or anything that boils down to just removing him from the landscape, this is not the thread for you. Be a super, not a party pooper. If you don't know much about Duke or need a refresher here's a link to his respect thread, his comicvine page, and his wiki for reference. I'll throw my pitch in the ring later. Last edited by lemonpeace; 01-31-2019 at 12:45 AM. First, keep up with the ground work done in the mini : Gnomon is out there trying to seduce more teenagers to join is crazy "Meta must rules" crusade. Meanwhile, Duke is investigation the disappearance of several kids, including Riko. Over time, he'll obviously deal with the Arkham Juvie problem children, stumble on the Houses of Immortals and discover more about it all, while juggling is sentimental life with Isabella and searching for a cure to heal his parents. I really liked the direction his mini was going. He had an unique role, a cool base and a neat supporting cast. Outsiders is fine but Signal protecting Gotham in the day is better.Why can't they just keep that. I think they should drop the Immortal Men connection; the miniseries was pretty bad but beyond that I don't see how Duke fits in with an eternal war between good and evil. It can be easily retconned anyway since it's canon that Duke's mother refused the Immortal Man's offer, whatever it was. Him being on the Outsiders is a good place for him to be but the way Snyder set him up was like he was meant for something bigger. I don't think being the day manager is that special; it doesn't do enough to distinguish him from the rest of the Batfamily. It's not like everyone else is sleeping during the daytime or otherwise out of commission. Like others have suggested, they should continue with the miniseries' direction, specifically Duke's relationship to metahumans. Metahumans being Duke's purview is a healthy balance between street level and epic, while also not being tied to any other Batfamily member. Although I'm having a hard time coming up with an actual job for Duke to do. His powers seem geared for forensics and detective work, but it would make for a poor mystery since he can see back in time exactly what happened in a location. I don't think it's a good look for him to go around incarcerating kids who are manifesting powers either. So I guess putting him on the Outsiders is a good move; on a team book, he doesn't have to always be the center of attention and can tackle metahuman stories in contained arcs. Apparently he's supposed to marry Gotham Girl in the future, which is kind of out of left field since neither of them have shown up a lot in King's run. Maybe the whole "This is where Batman died" thing is meant to be a set-up for Gotham Girl and Duke taking over the protection of Gotham City, for the duration of however long Batman is supposedly "dead". It could foreseeably work, what with Nightwing being an amnesiac, Jason and Damian going rogue, and Tim being de-aged for Young Justice. I like to holistically integrate as much as I can with a characters proposed direction, so it's helpful to think back to the build up. Zero Year: Duke was a kid helping Batman stay low key from Riddler. Not too complicated - a kid that helped Batman in the past becomes an ally. Endgame: His parents get Jokered in the biggest Joker attack in history. Not too complicated - another "my parents are messed up" backstory for a hero. Don't overplay the Joker. Robin: Obviously his friends group from We Are Robin sticks as being very important, as well as the "why" of the We Are Robin mantra, which is that kids idolize Robin, think Batman needs an assist, and are young, social savvy, and want to generational shift away from the obviously uncool Gotham City status quo that's been going on for years. Signal: I like the yellow costume though I wouldn't mind seeing it streamlined a bit to be less armor-tanky. I don't mind the Metal connections, I guess the gist is that there's some linkage between Metal, like the Cosmic DCU Metals, and the meta-gene itself. So follow that thread through. Immortal Men: Phew ... I dunno. Yeah, talk about roads to nowhere. But if we could write-off their interest in just being able to predict the Metal/meta-gene connections I guess we could say that maybe it's just a scheme to groom important meta-humans and he's not a Chosen One trope. You also don't just want his power to only be important when these Dark Multiverse / Cosmic Metal type schemes come into play in CRISIS level events, because that makes him like Harbinger or Pariah or something - basically only important during a Crisis. I think he's too important to just stick around in Gotham, even if it's his hometown and typical Gotham bullsh** is part of his heroic origin story. I also think you don't want to lean too far into "Metals" themselves, as Element X is New God stuff, Nth Metal is Hawkman stuff, and so forth. So I dunno, I'd say a story where at the behest of Batman, Duke Thomas (with the help of his We Are Robin compatriots) uses his powers, I dunno, "Cerebro-style" to find kids whose meta-genes are activating, to bring them into a school where they train to use their powers responsibly works wonders. Yeah, I know it's literally just The X-Men in the DCU, but you've got those layers of like, Batman both wanting to help kids, teach responsibility and protect people but also wanting to keep an eye on the next generation of possible problems, and leaving Duke in the lurch of having to be the one engaging in that. Then you can set up Gnomon as basically a Mister Sinister type, find a nice philosophically opposed dude to be the "Magneto" type, and introduce a bunch of characters. And since Tim Drake isn't that likely to be part of the Superhero School tease, since he's back to Young Justice, just give Duke the position. And of course make him somewhere between Professor X and Cyclops. Hell, bring Sideways into it, and Olive Silverlock, absolutely. Steal back a bit of that Gotham Academy swag. It would also be pretty easy to bring maybe the Forever People in for a story. Gotham Girl would work fine here, maybe. Last edited by K. Jones; 01-31-2019 at 12:19 PM. Retro315 no more. Anonymity is so 2005. Yeah, I'd just build on the mini. Keep the We Are Robin kids around for a supporting cast, and build up. Lots of great stuff in the mini, a solid niche and role and a beginnings of a quality villain. I'd like to see Duke set up in Gotham Academy so those characters can still find a place to show up, and I like K. Jones' idea of Duke finding other metas, though that *is* a little too Xavier School for my tastes, unless it's executed very well. I think the only thing that needs to be done with Duke and the direction they've set up for him is to keep building on it; he's got a great spot to work with, no reason to change it, just use it more! I'd follow the herd and continue where the miniseries left-off. A few other plot threads like his rivalry with Riddler, the tease with Gotham Girl, the Cursed Wheel from the backups and his connections with the We Are Robin kids will be picked up. I don't know what to do with the Immortal Men tease but that should get resolved too. I do want him to interact with Caden, Sideways, Silencer, Damage and the other New Age heroes. I keep thinking about him as a private eye like Jamie Madrox of X-factor fame so maybe I'd give him a trenchcoat? idk just a thought. I'm gonna be boring and pick the same direction everybody else did. I like the whole daytime meta thing, I thought it was unique and it doesn't step on anybodies toes. However I'd give him a redesign, remove all the bat symbols and give him a new one. I'd keep the yellow color scheme as well. Last edited by 9th. ; 02-02-2019 at 01:47 PM. I only read the first issue of the Signal. I didn't care for it. I just don't like anyone in the Batfamily to have superpowers. It's just a personal preference. So first thing I would do is rid him of his powers. The next thing I would do is restore his family. My idea goes something like this, Bruce fires him, not because he was incompetent (very important) but because he was afraid of him getting hurt or something. Duke continues to be the Signal (or preferably a cooler persona). He handles mobsters and drug dealers mostly. The We are Robin crew join him as his team. Some as full fledged vigilantes others as Alfred-type helpers. Very occasionally they fight a meta or a big threat. Seeing that Duke isn't going to stop, Bruce supplies him with a base and equipment cleverly concealed in his apartment building, the same one he lives in with his parents. Hi-jinks ensue! I basically want him to be the everyman of the Family, like everyone says Tim is...but clearly isn't . Put the focus on his family life and his relationships with the war kids. Forget about Gotham Girl. (She's terrible. Or at least painfully generic) He can still operate during the day. I was reading old Batman comics and got nostalgic It was nice to see Batman plotting how to take down a few mobsters, fixing an old ladies sink and actually being a detective. Duke could easily fit into that kind of role. Kill him for cheap dramatic tension. Then have him come back in a couple years as Orpheus. Isn't he already coming back as the new black Batman when Ban finishes destroying Bruce? Talk about not having earned it. But yeah, Snyder wants a black Batman and hasn't made it a secret. Gotta drive the rest of the batfamily away before that happens. But that's more or less what's happening right now. Having a black Batman for awhile might be a good thing. 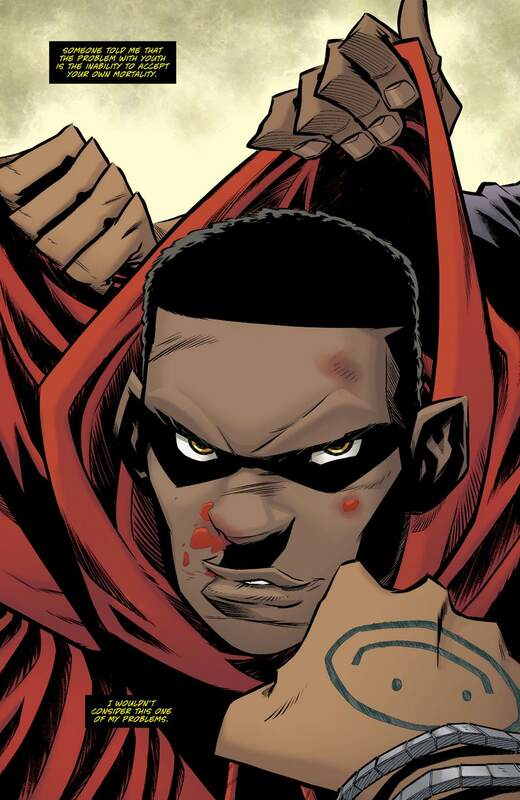 It would show that the company is sensitive toward the paucity of major black characters in comics. Having any Batman but Bruce is pretty risky, but doable. Having any Batman but one of the 4 Robins is begging for a PR disaster. Azrael seemed to do just fine.